BERNARDS TWP. – A growing gap between the rich and poor has become a hot topic in the 2016 Presidential election, and a new book co-authored by a township resident offers solutions to the issue that are drawing praise from prominent officials and economists. “THE 3rd WAY,” written by Veny W. Musum of Basking Ridge and former state Assemblyman Upendra Chivukula, D-Somerset, Middlesex, follows neither conservative nor liberal dogma in laying out a diagnosis and cure. It proposes a more “inclusive capitalism” in which government would encourage businesses to share assets with their workforce. The bulk of wealth in today’s economy derives not from wages but from capital assets like stock and real estate, Musum said in an interview on Friday, Jan. 29. As result, he said the wealthiest 1 percent have seen their wealth increase by up to 275 percent in recent years while the average person has seen no increase at all. 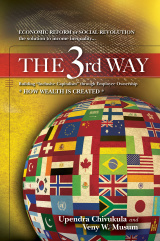 Under the solution offered in “THE 3rd WAY,” businesses would establish employee stock ownership plans (ESOPs) that would allow their workers to acquire capital shares without depleting their own savings. That would provide the workers with capital income to supplement their wages. “It’s a common sense idea,” Musum asserted. He said about 10,000 American businesses with some 15 million workers already have ESOPs. Musum viewed the idea as non-partisan, noting that he is a Republican and Chivukula is a Democrat. In fact, he said the supporters of employee ownership have ranged from former President Ronald Reagan to Sen. Bernie Sanders, D-Vt.
“When you have Bernie Sanders and Ronald Reagan agreeing on the same thing, you might have something,” he said. Praise for “THE 3rd WAY” has been equally diverse. The book lists plaudits from former state Assembly Speaker Sheila Oliver, D-Essex, U.S. Rep. Dan Rohrabacher, R-Calif., who was a speechwriter for President Reagan, former ADT Inc. chairman and CEO Ray Carey, and Harvard University economics professor Richard B. Freeman. Musum, 60, formerly worked in private industry in the hair-care market, first as a district manager for Clairol, Inc., and then as senior vice president for John Paul Mitchell Systems in Beverly Hills, Calif. Chivukula, 65, of Franklin Township, is an information technology company executive who served in state Assembly from 2002 to 2014. Musum and Chivukula have been friends for several years, and they began working on the book three to four years ago. The book is 259 pages. “We did a tremendous amount of research,” Musum said. “I knew there had to be something better than what we have now.” But “we don’t want big-government, top-down redistribution. That doesn’t work. Musum said that in 1776, 95 percent of American production was from labor, and only 5 percent from capital, which was mostly land. Today, he said, 90 percent of production is from capital – a change he attributed to advances in technology. “This is why people’s wages are not going up,” he argued. He characterized the focus on raising the minimum wage as “pathetic,” saying “it’s not addressing the other side of the equation. Capital is where the money is. As an incentive, the authors suggest cutting the corporate tax rate by up to 50 percent but only for businesses that agree to share their equity with workers. In impoverished inner cities, the corporate rate reduction could be as great as 100 percent. 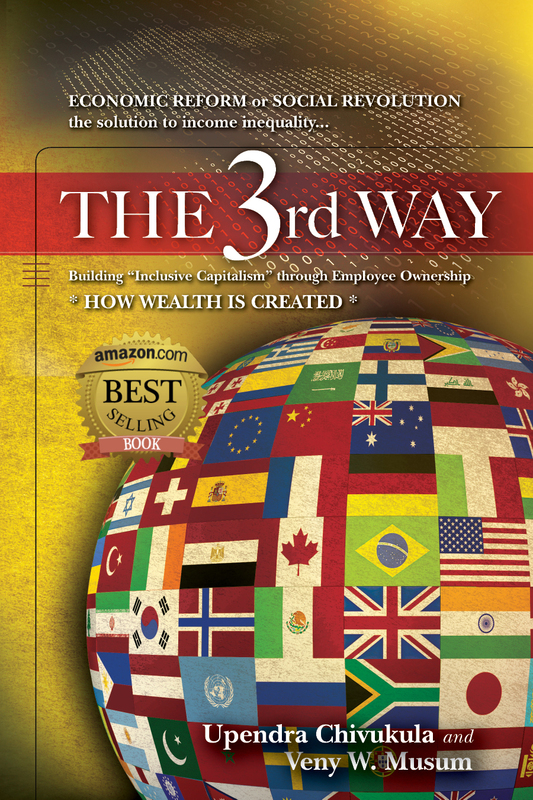 The book, published by THE 3rd WAY Publishers, can be purchased online through amazon.com via a link from the3rdwaybook.com. In spite of the book’s impressive endorsements, Musum said any impact will be in the hands of the average reader.